Pluteus romellii is a distinctive wood-rotting fungus of broadleaf (hardwood) and mixed woodlands. In Britain this rather uncommon fungus is found throughout England, Wales and Scotland; it is also found in Ireland.The Goldleaf Shield is also found in many parts of mainland Europe. The basionym of this species was established when the Goldleaf Shield was described in 1891 by German mycologist Max Britzelmayr (1839 - 1909), who gave it the name Agaricus romellii. It was Italian mycologist Pier Andrea Saccardo who, in 1895, transferred this species to the genus Pluteus, whereupon its scientific name became Pluteus romellii. Synonyms of Pluteus romellii include Agaricus romellii ;Britzelm., Agaricus nanus var. lutescens Fr., Pluteus nanus var. lutescens (Fr.) P. 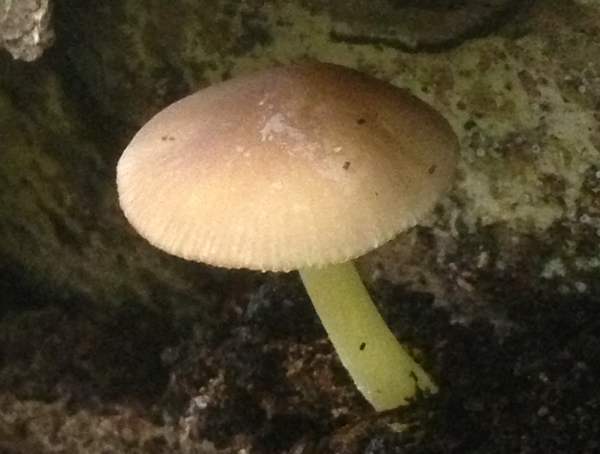 Karst., Pluteus lutescens (Fr.) Bres., and Pluteus splendidus A. Pearson. Pluteus, the genus name, comes from Latin and literally means a protective fence or screen - a shield for example! The specific epithet romellii honours Swedish mycologist Lars Rommel (.1854 - 1927), one-time associate editor of Mycologia. 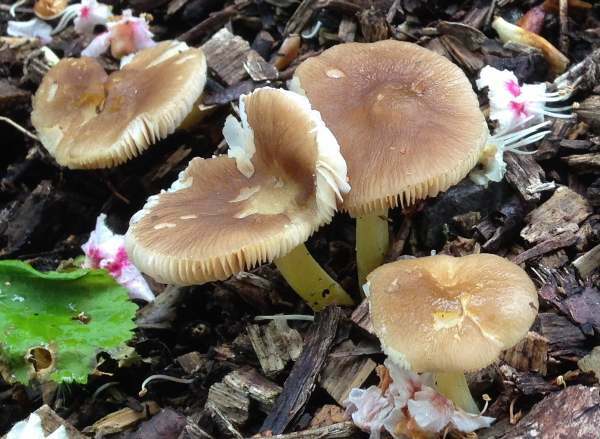 Smooth near the rim but often wrinkled towards the centre, dark cinnamon brown in the centre but often more yellow towards the margin, initially convex and usually flattening with a low broad umbo, the caps are 1.5 - to 5cm in diameter. 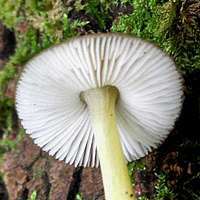 The thin cap flesh is translucent white and firm. White or yellow at first, becoming pinkish yellow, the gills are broad, crowded and free. 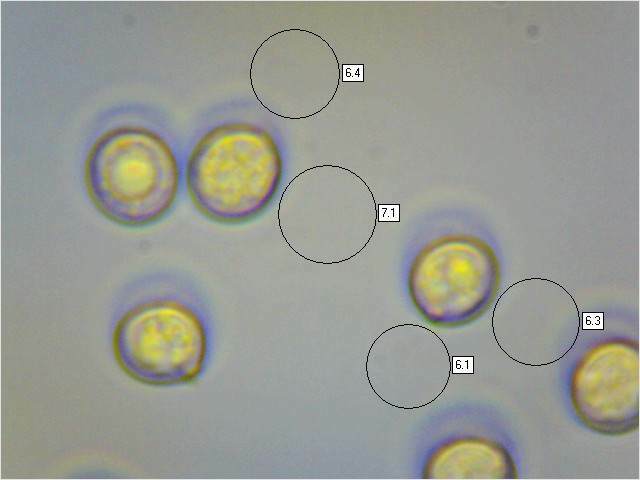 Lemon yellow, but more chrome yellow towards the base, often broadening at base; longitudinally striate; 2 to 6mm in diameter and 2 to 7cm long. The stem flesh is yellow. 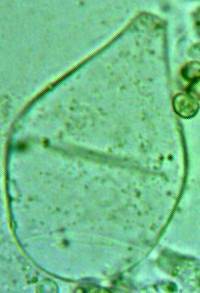 Gill-edge cystidia are similar to the pleurocystidia.. 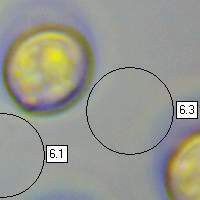 Broadly ellipsoidal, smooth, typically 6.5 x 5.5µm. Saprobic, usually solitary on well-rotted long-dead stumps, buried rotting fallen branches, sawdust, wood chips,and other woody debris of broadleaf trees, particularly beech, ash and occasionaly blackthorn and elder. Fruiting from early summer to late autumn, provided the weather is mild. Most often fruiting from mid summer to mid autumn. 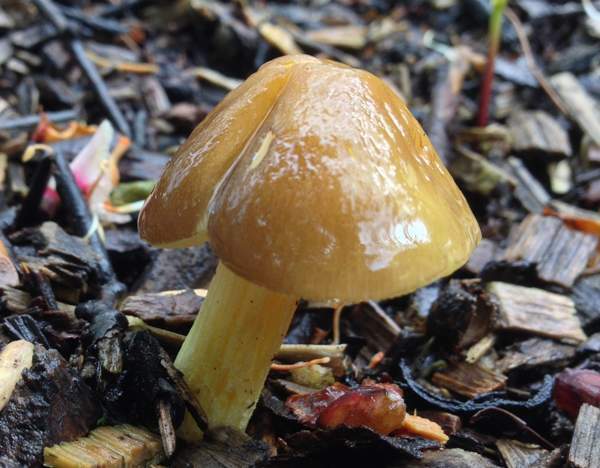 Pluteus umbrosus has a darker brown wrinkled cap and is generally a little smaller. 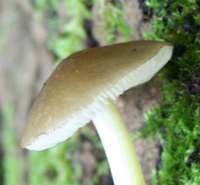 Pluteus cervinus has a smooth brown or fawn cap. The Goldleaf Shield mushroom Pluteus romellii is reported to be edible but caution is advisable, especially if you have any doubts about identification, because some fungi in the genus Pluteus contain the toxin Psilocybin. This page includes pictures kindly contributed by Simon Harding and Zoran Bovovic.